The King Air C90GT IS a fuel-efficient, twin-turboprop aircraft produced BY the Beech Aircraft Corporation, today Hawker Beechcraft Corporation. The King Air C90GTi IS ONE of the latest models of the Beechcraft King Air family, which IS recognized FOR its unmatched versatility, reliability, AND safety. The King Air C90GT features increased performance AND greater system redundancy over the King Air C90GT, AND it IS equipped WITH the same higher-performance Pratt & Whitney Canada PT6A-135A ENGINES AS the King Air C90GT. The King Air C90GT has been upgraded WITH the advanced, fully integrated Collins Pro Line 21 avionics suite, the same system FOUND IN the King Air B200GT, King Air 350, Premier IA, Hawker 750 AND Hawker 900XP. Other major improvements include a multi-sensor flight management system that utilizes several aircraft position inputs, solid state weather radar AND Collins patented Chart Link TM automated chart selection system, ALL of which greatly reduce pilot workload. The Beechcraft Corporation announced the King Air C90GT at the Oshkosh Airshow in July of 2005. 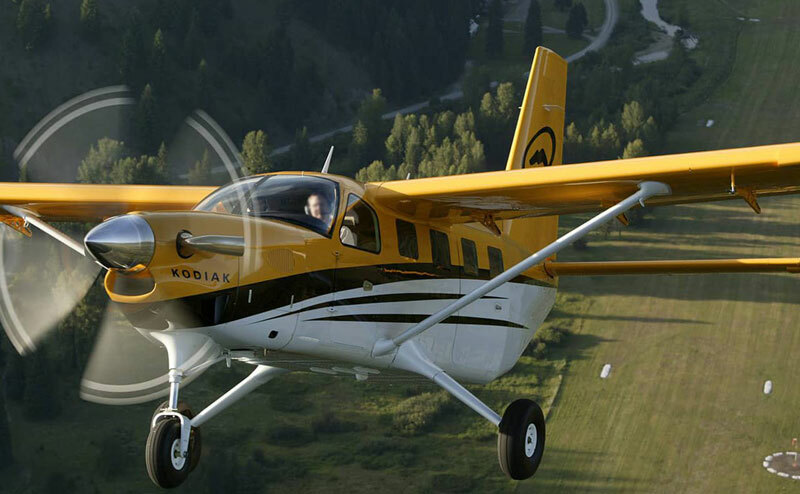 This model featured upgraded 750 shaft horsepower (SHP) Pratt and Whitney Canada PT6A-135A turboprop engines, which were flat rated to 550 SHP. This rating allows for cooler temperatures and better performance during the takeoff, climb, and cruise phases of flight. In May of 2007, the Beechcraft Corporation announced the King Air C90GTi. This model would serve as an upgraded version of its predecessor and features a Rockwell Collins Pro Line 21 avionics suite. The cabin of the King Air C90GTi is typically configured to accommodate five to six passengers in a club style configuration. In a high-density arrangement, this private business jet is capable of accommodating a maximum of eight passengers. The cabin of the King Air C90GTi measures 12.4 feet in length, reaches 4.8 feet in height and stretches a maximum of 4.5 feet in width with a floor width of 4.1 feet. This private business jet features 48.3 cubic feet of baggage storage capable of accommodating 350 pounds of luggage. With a maximum cabin pressure differential of 5.0 psi, the King Air C90GTi is capable of maintaining a sea level cabin altitude at an altitude of 11,065 feet. 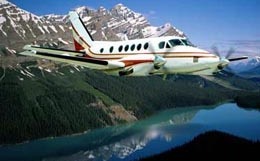 The King Air C90GTi comes equipped with two Pratt and Whitney Canada PT6A-135A turboprop engines. Each engine is rated at 550 SHP at takeoff. With these engines, this private business jet is capable of climbing to an altitude of 25,000 feet in just 17 minutes. The King Air C90GTi requires 2,392 feet of runway to take off at sea level on a standard day. At an airport with an elevation of 5,000 feet, this takeoff requirement increases to 3,372 feet of runway. With four passengers, the King Air C90GTi needs only 1,672 feet of runway to land. This private business jet features a maximum certificated service ceiling of 30,000 feet and a maximum range of 1,068 nautical miles. For a flight to a further destination, the King Air C90GTi is capable of maintaining an airspeed of 208 knots at an altitude of 26,000 feet in a long range cruise configuration. For a swifter flight, this private business jet is capable of maintaining an airspeed of 270 knots at an altitude of 20,000 feet in a high-speed cruise. The King Air C90GTi comes standard with an upgraded Rockwell Collins Pro Line 21 avionics suite. This advanced system utilizes three LCD display screens, which act as primary flight displays (PFDs) or multifunction displays (MFDs). An electronic chart database can be downloaded and connected to the MFD to allow for paperless flight planning. Instrumentation found in this advanced suite include a 3D navigation Flight Management System FMS-3000, Pro Line 21 CNS radios, an Integrated Flight Information System (IFIS), an Automatic Direction Finder (ADF), an XM Broadcast weather system, a File Server Unit (FSU), and a solid-state weather radar. For more information about chartering, leasing or buying a King Air C90GTi please contact us by calling +44-20-3874-8091 or send us an email here.